When it rains, temperature, salinity, pH and dissolved oxygen in ponds will be reduced significantly. Thus, shrimp care during rainy season with continuous and prolonged rains becomes difficult for people, even with experienced farmers. From the discharge of water to the management of feed intake, avoid inadequate or excessive feed is important. Black tiger prawn is a cold-blooded (or poikilothermic) species. Its body temperature can only change in a limited range. But, if environmental factors change dramatically and exceed permitted limits, shrimp will be weak, shocked, and possibly dead. Farmers should have a careful and regular preparation in from pond processing, management to farming. Settling pond should be about 1/3 to 1/2 farming ponds. Farming ponds can be changed alternatively after each farming season. Farming ponds can be settling ponds and settling ponds can be switched into farming ponds. Reserve enough water to replace water in farming ponds if necessary. Do not breed shrimp with too shallow water levels. During rainy season, shrimp should be farmed with a moderate density (<25 shrimps /m2 with black tiger shrimps and <100 shrimps/m2 with whiteleg shrimp). • Install aeration system: an aerator is estimated to provide enough oxygen for the 2800 shrimps from the release until the harvest. + When aerators operate, water has to swirl in the middle of the pond to collect organic humus to the center. + The speed of the aeration must reach 80-85 rounds/minute. + How to test: Run aerators, pour 5-10kg saponin into the pond. If bubbles are concentrated in the middle of the pond, aerators are properly installed. • Install oxygen system in the bottom of the pond with plastic tube or pumice stones. + Check the appearance, color, reflectivity; check shrimp gut and shrimp feed in the farm, etc. + Check pH, alkalinity, turbidity, salinity. • The pH in shrimp ponds is always need to be 7.5-8.5. • Rain water is acidic. It can wash out alkaline from edges of the pond and reduce pH of water in the pond. • To limit the decrease of pH when it rains, use lime along edges of the pond before it rains (apply it dryly) with 10 kg lime/100m2. After the rain, use lime with 10-20 kg lime/ha. • Combine aerators to prevent water stratification. When it heavily rains, the increasing water levels in ponds need to be discharged to prevent a sudden decrease in salinity, overflow, and broken sewers. 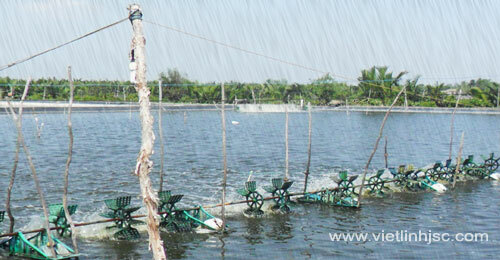 See "Manage shrimp ponds during rainy season - Part 2"